Good things take time, and the best things usually take way longer than you could have possibly anticipated. 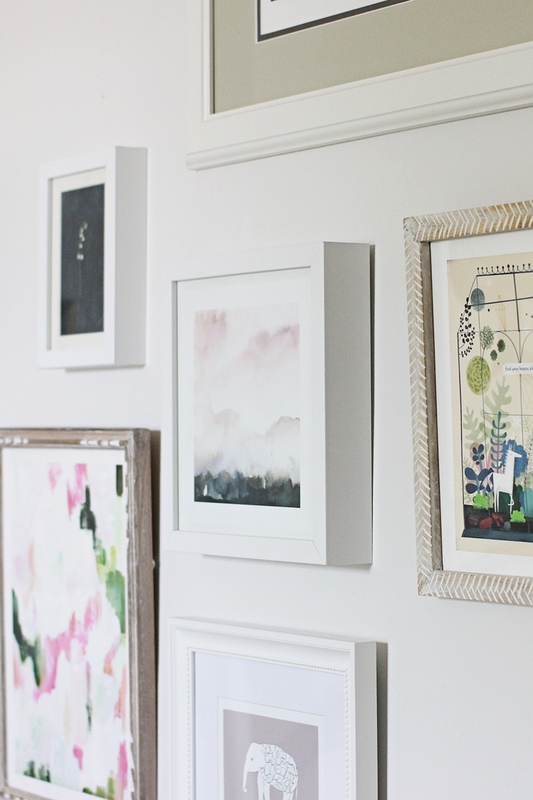 When I shared my plans for this gallery wall back in June, I imagined it taking two weeks to get everything gathered and on the walls. In actuality though? It's August and nowhere near 'done'. 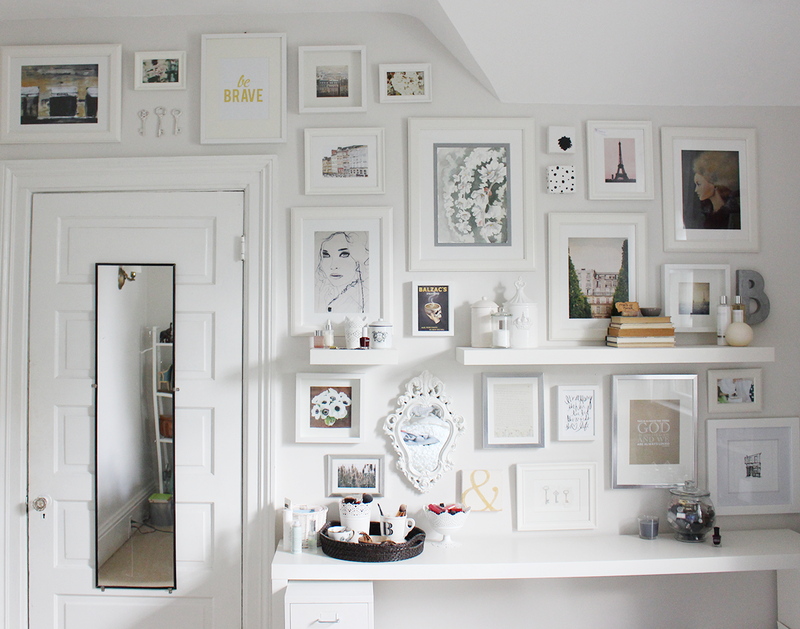 The best gallery walls have a mix that look like they've been carefully curated over a period of time. 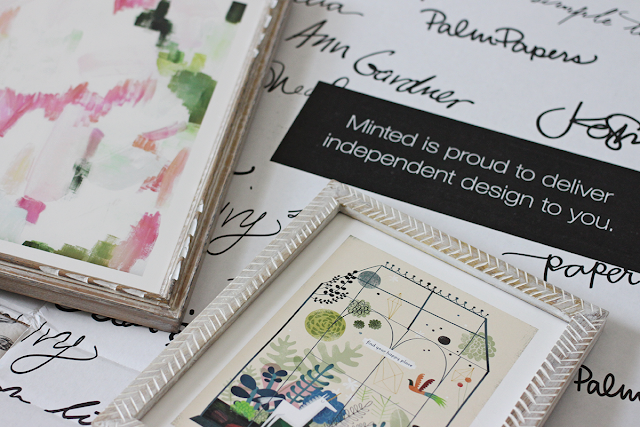 While my first gallery wall took almost 3 years, Minted's mix of art definitely helps speed that process up. I've been planning & tweaking the layout, and the final pieces are starting to come together, but it's probably going to be September before this project is finished. And you know what? I'm okay with that. Because to truly love the end result, you have to love the process it takes to get there. 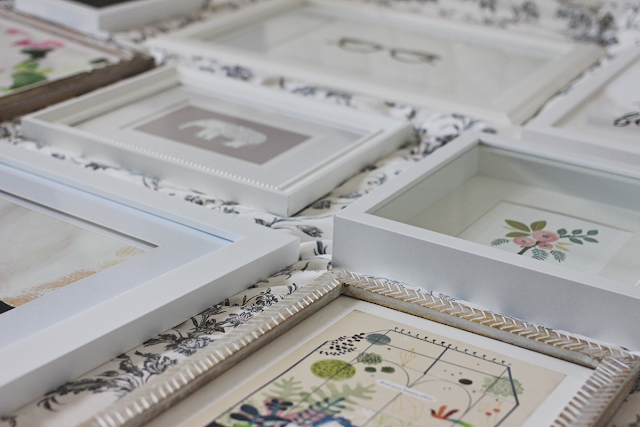 And just as an aside, I was really impressed with Minted's framing options. 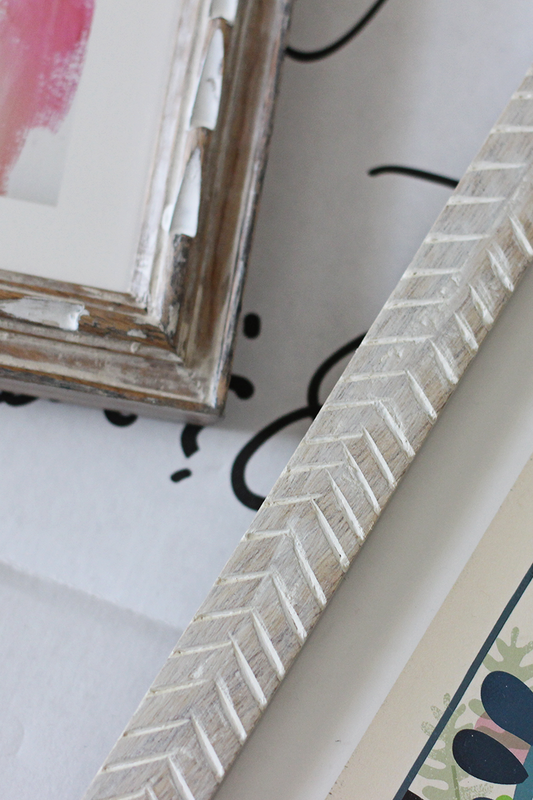 I chose white wood (on the 'work hard & be nice print') whitewashed french farmhouse & whitewashed herringbone, and they all look way better in person than they do online. 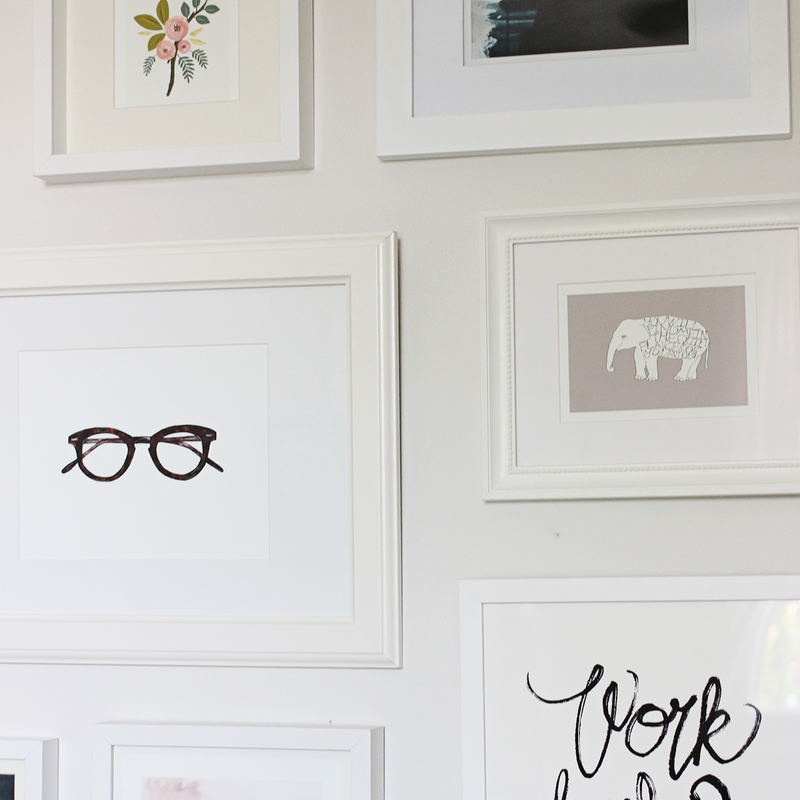 So that's all I have for this gallery wall update :) To see more of the process, you can check out my Instagram or past blog posts. Had to schedule this post before I left this week to make sure I could celebrate with all my fellow Canucks today :) If you've got any fun celebrations or firework shows to attend tonight, this mani would be perfect! Hope everyone celebrating this week has an awesome time! I always keep bookmarks or tabs open for posts or things I want to share here, and since it's been a while, the list is a little long today haha but isn't that what weekend reading is for? 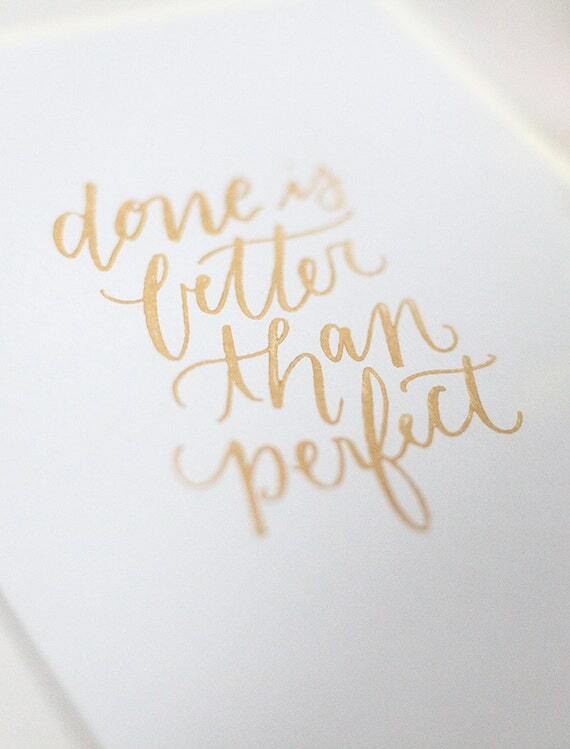 ;) Here's to crossing things off our to-do lists and having a beautiful weekend! Think you're good with colours? Try this mildly addicting game that will test that fact. 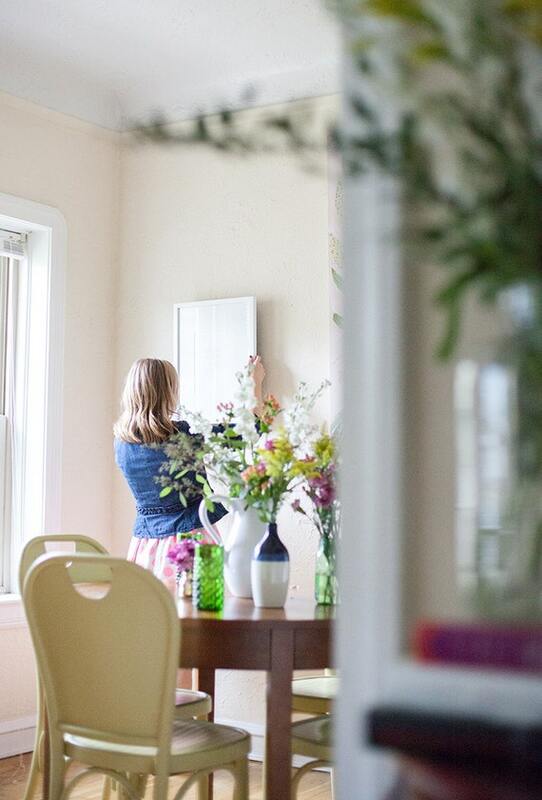 Just a wee bit obsessed with these repurposed vintage plates from Melissa of The Sweet Escape. Something you may not know about me? I'm a huge fan of the Fast & Furious franchise - no really! There is a bit of a back story there, but needless to say, I saw & loved the latest instalment - and I wasn't the only one. Is your to-do list full of should-do's? Then this essay on the crossroads of should & must is for you. We live in a beautiful world. I'm already a big believer in the power of quiet, but I loved Grace's post on listening to what really matters. Thoughts on being selfish on Instagram - some really good thoughts on what we share & the reality behind it. Creative business owner? Here's some tools to help you work better. In case you missed it, Anna's blog got a makeover & looks so stinkin' good! I seriously get to work with some of the best people. Ever wondered what your pet does when you leave the house? I'm pretty sure Winnie sleeps all day, but oh man, I got a good laugh at this trailer for 'The Secret Life of Pets". Social media does have it's uses, and getting hired may be one of them. Feeling stuck? Here's some thoughts on hitting the reset button and turning June into January. , it hasn't been feeling quite 'right'. It needed something and I just couldn't place my finger on what it was.
) and I'm still totally in love with it. So stumbling with this 'expansion', if you will, left me feeling a bit unsure. :) and a few from minted too. I love the mix of old, new, and personal touches, with a dash of quirky thrown in! I was so excited when Kelsey agreed to an interview. Her work is gorgeous and the story behind Pinegate Road is beautiful - I know you'll love it! What inspired you to open your shop? 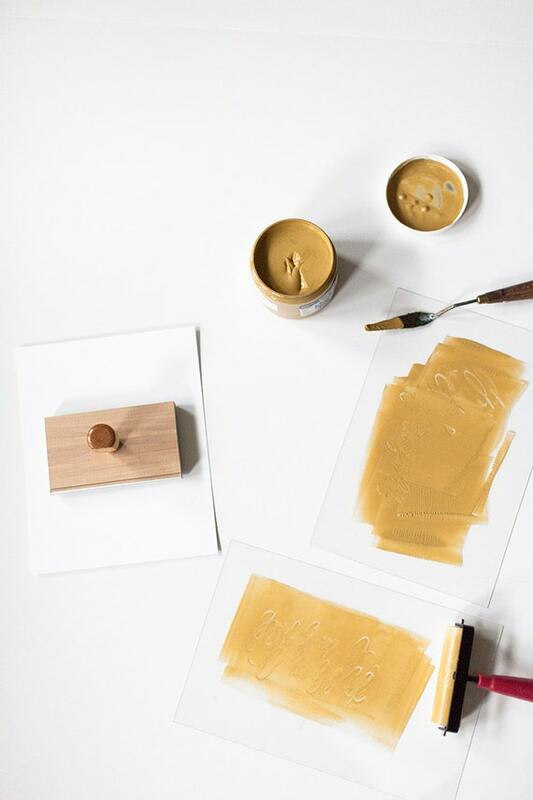 I've always dreamed of creating my own products. Working with my hands has always come naturally and is something that I love doing. As I started going down the rabbit hole of working on Pinegate Road, there were several mantras that I came back to time and time again that helped me along my personal creative journey. 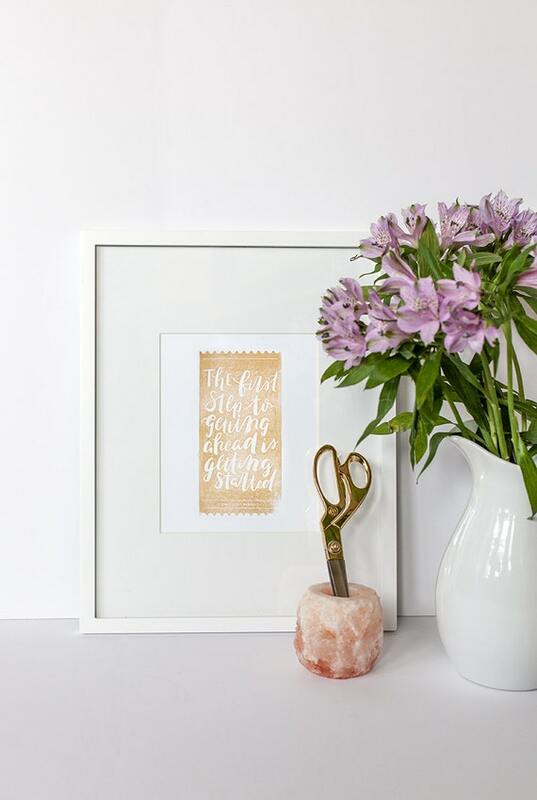 Taking my love for hand-lettering, my need for a hand-made project, and the thought of creating products inspired me to create these prints. Where did the name 'Pinegate Road' come from? I really need to get on adding this to my about page ;) Pinegate Road is the road where I had my first 'home.' Growing up, I moved around a lot. By the time I was 9, I had lived in 5 states and 6 cities. Around this same time, my mom found out she had cancer. It was a huge shock to my parents, and this had them evaluate where they were at in life and what dreams they wanted to live out. My mom always wanted to raise her kids back in her hometown on Lake Erie, and my dad had always wanted to run his own business. My parents, my brother, and I moved up to Pennsylvania where my mom successfully beat cancer, and my dad started a thriving business. Pinegate Road is where our start as a family came to be, and my Pinegate Road is where I started coming to be as a designer. Pinegate Road hold such sentiment to me, and I love that it's a symbol of new beginnings and following life-long dreams. 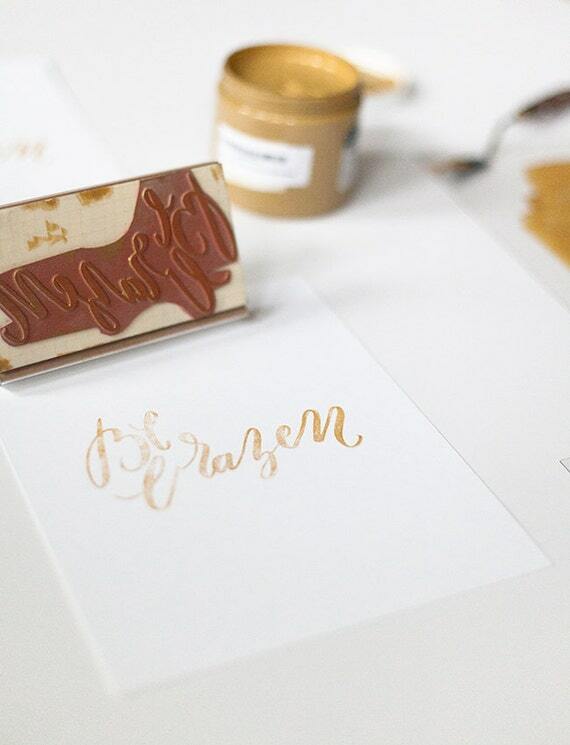 What drew you to your chosen mediums of lettering & stamping for your prints? I wanted to create something that was unique and that had a hand-made element to it. Both my day job and Pinegate Road have me working very digitally, and reconnecting with physical processes was something that was important to me when starting this side project. At the same time, I needed something that was easy enough to duplicate. I studied block printing a bit in undergrad, and knew that a mix of stamping and block printing would give me a unique result that I could replicate for prints. Is there a cool back-story behind one of your prints? I didn't expect these to turn in to a shop! Last summer I was asked to come to the Weapons of Mass Creation fest here in Cleveland as a featured artist. As part of the arrangement, I was to submit three posters to their gallery show to be on display. I could have used old work, but I treated this as a new project and went to work brainstorming. Creative process is always on my mind, so creating helpful ways to work through process in the form of mantras was what I became drawn to. On three of the prints, you'll see that they have 'the ticket project' written on them. My idea here was that these would each serve as a person 'golden ticket' to going for your dreams. I'm not sure how much I love that this is on there now, but hey, it's the creative process and I can always adjust later! What is your favourite item in your store? 'done is better than perfect' for sure. 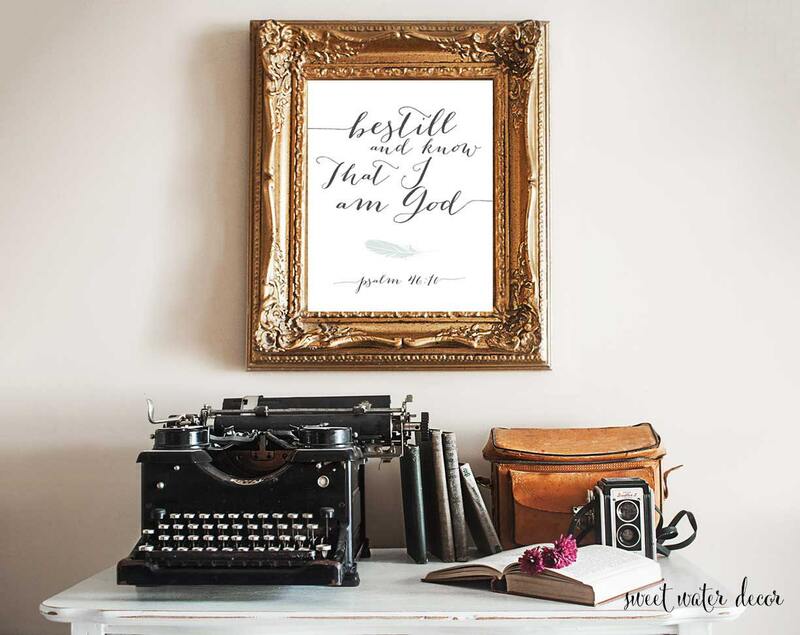 I love the way it fits on the page for a print, and it is something I constantly have to remind myself. What's next for you and/or your shop? Where do you see your shop heading? Any tips for aspiring calligraphers and/or print shop owners? Practice, practice, practice, and don't be afraid of not being perfect right off the bat! I feel so many people are paralyzed by things not being 'good enough' or perfect enough that they never start. Start with baby steps, and don't be afraid of the journey. You have no idea where you'll end up, and that's part of the fun! I mean, I knew Kelsey was awesome since we've become 'instagram friends', but this interview was one of my favourites. Thankyou so much Kelsey!! Over the past three summers, I have grown a little herb garden. What started as a lone mint plant back in 2012 has ended up growing into a whole little collection! Isn't this blue container just the sweetest? I picked it up in HomeSense a few weeks ago, knowing my annual herb garden would be starting again soon. Love the blue with the gorgeous green of the herbs! The gloves & the little trowel both came from the Home Depot. I have to admit I love the measurements on the trowel, and that the gloves have velcro around the wrists to keep the dirt out. Good tools make the job so much easier! 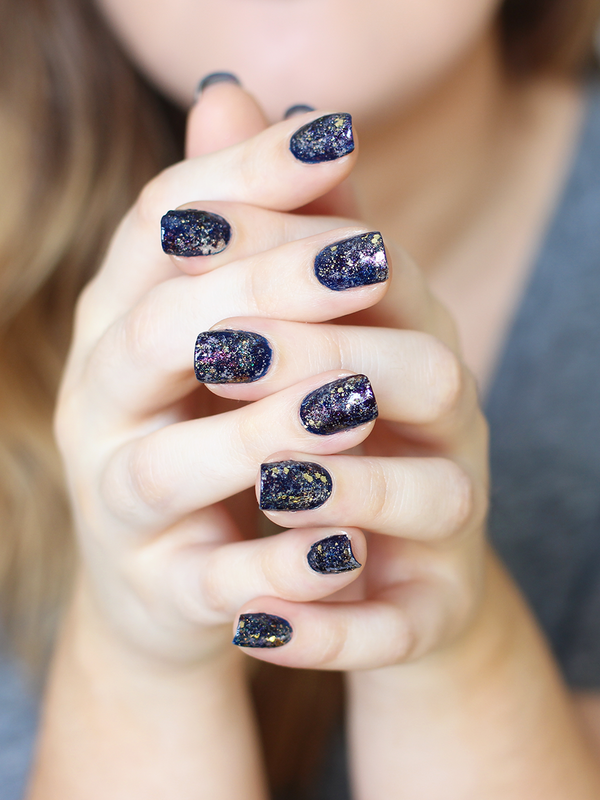 Galaxy nails were something (like marbled nails!) that I've always been intrigued with, but never tried before. I had an event last weekend that necessitated something special with my nails, so I decided to finally bust out a sponge and try this out.I used Marc Jacobs New Wave as a base (any good navy would work), and then let it dry a little before sponging on the other colours. I had an old craft sponge (similar to the smallest one in this set) that I used to lightly layer the 'galaxy' colours. It's no secret that I love a good cat-eye liner. And over the years, I've used lots of different products to achieve the look. Between gifts from friends & Sephora bonuses, I've amassed quite a few and thought I would share my favourites, why I love them, and which ones I think can be skipped. I've gone through about 3 tubes of this stuff. It's super black, the felt-tip is great, it lasts all day, and the price point is fantastic. This is the one I reach for when I need a quick, no fuss liner. It glides so beautifully and will always be a staple for me. I'll call this a 'marker' style tip to differentiate it from the felt tips. (The tip is 'drier', and more like a marker than a true liquid liner.) It worked well, but I found it faded to a more grey shade that I didn't like. This has more a 'marker' style tip as well, but it's much smaller and the colour is a deep black. It also lasts all day - even my coconut oil makeup remover sometimes has difficulty with it. I love this one for it's precision; it might take a bit longer to apply because it doesn't 'glide' well - 'stamping' works better with this one - but I know it won't budge at all. Unlike any other liner I've tried, Benefit created a gel liner with a built in application system. I do like it, but you have to have enough product on the tip for it to apply well, but not too much or else it clumps and falls off. It takes a bit of practice, but the results are worth it. Truthfully? This is practically identical to the Lineur Intense from L'Oréal; they are sister companies after all. The gold on the packaging is lovely of course, but I found the colour of this one wasn't quite as black as I would have liked. This & the Stila one below were from the Sephora liner favourites kit released around Christmas. (Great kit by the way!) I'd been wanting to try this out after hearing a lot of hype about the 'brush' tip and I'm so pleased to say I was not disappointed! The colour, the tip (it really is a little brush), the ease - SO good. Probably my all-time favourite on this list. 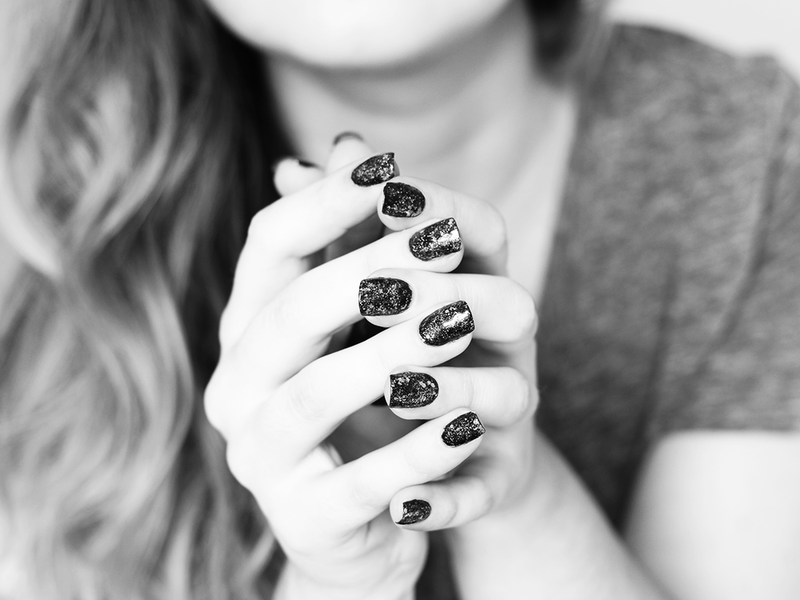 If you're looking for a liner that will not budge one millimetre, then this is for you. I have it in the dark brown shade, which is a nice change some days from the black. The colour is great, the marker tip works really well and there's no fading or patchiness as the day goes on. You definitely will need a great make-up remover to get this off (even coconut oil struggles with it) but that's a small price for a liner that doesn't give up. Melissa reached out to me about her shop, Sweet Water Decor, and I knew it was a perfect fit the moment I opened her shop. It is full of my favourite fonts, happy prints & cheeky mugs. She was even sweet enough to offer a discount that you can find at the bottom of the post, so read on! I got engaged in September and was going through all of my stuff and actually decided to open my shop to sell my acrylic paintings. 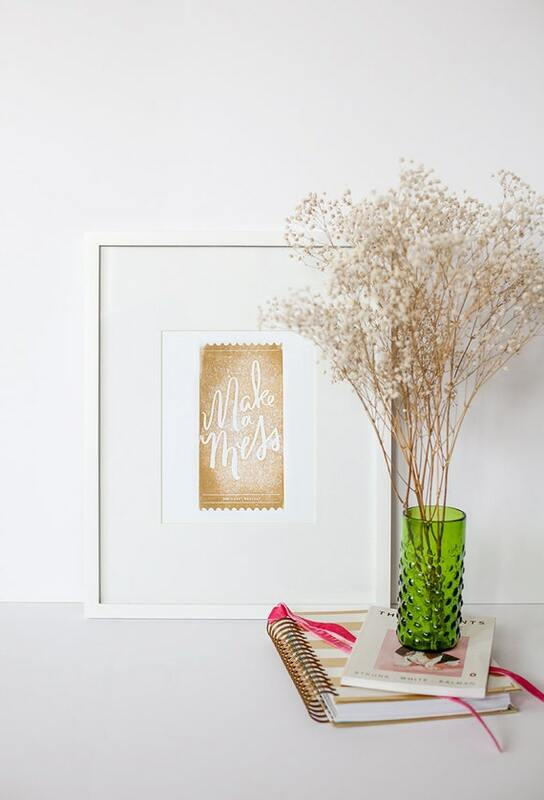 From there I started adding art prints, save the dates, wedding invitations, mugs + stamps! 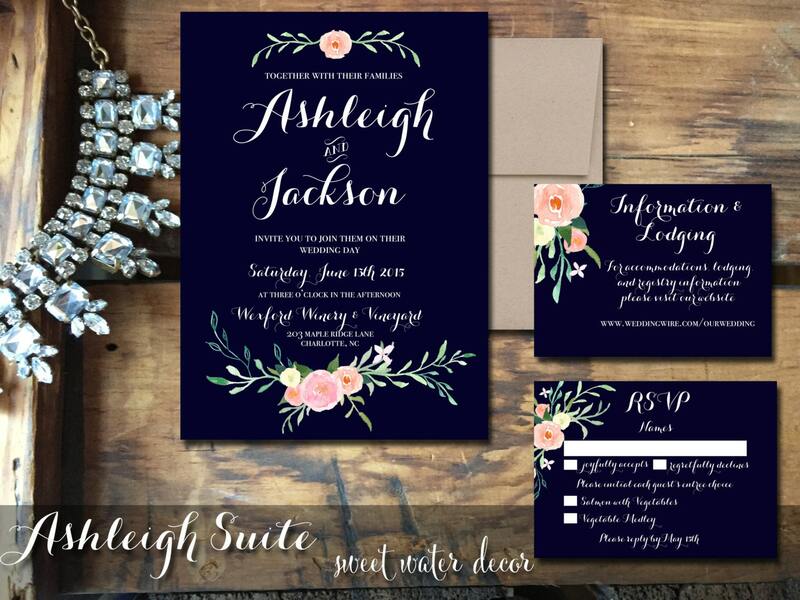 Searching for my own save-the-dates on Etsy, I started looking around and thought, I could definitely design these myself! I took photoshop classes in high school and have a natural talent for art. When I was younger I wanted to be a designer. I combined that with my merchandising background - being a buyer for a major retailer, and voila! My shop was born. I imagine brides like me shopping at my shop. The girls that love a little bit of glamour mixed with shabby chic with a modern twist. I love getting inspiration and use my fashion background to come up with some of my ideas for the shop. I just opened my second Etsy stop - Stamps Lux - where I sell stamps exclusively. What is the process of creation like? I first get inspiration, either while walking in my beautiful small town, Starbucks coffee in hand... to washing dishes...ideas come to me. I even have these little notebooks that I carry with me or are by my bedside that I jot design ideas as I get them before I go to bed. From my idea I create it in photoshop and bring it to live. I love it when I see my own designs on paper or on my mugs instead of just in a picture. We print all of our mugs, and it's so exciting to see a final product! Your work features some gorgeous typefaces, do you have any favourites currently? I use a lot of Carolyna Pro - it's perfect for weddings! But I've fallen in love with Jacques & Gilles and even used them for my own invitations! 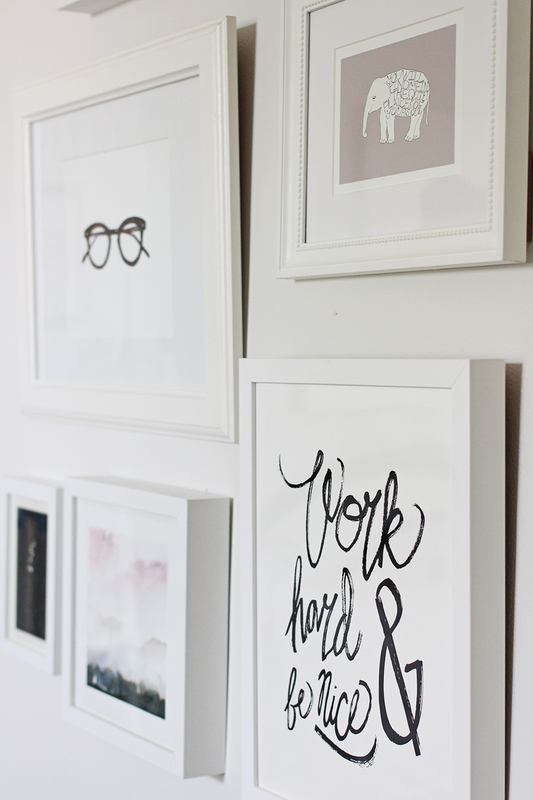 Emily Lime creates such beautiful fonts - I'm pretty sure she's my best friend I never met. also available as a print! Is there a cool back-story behind one of your prints or other products? 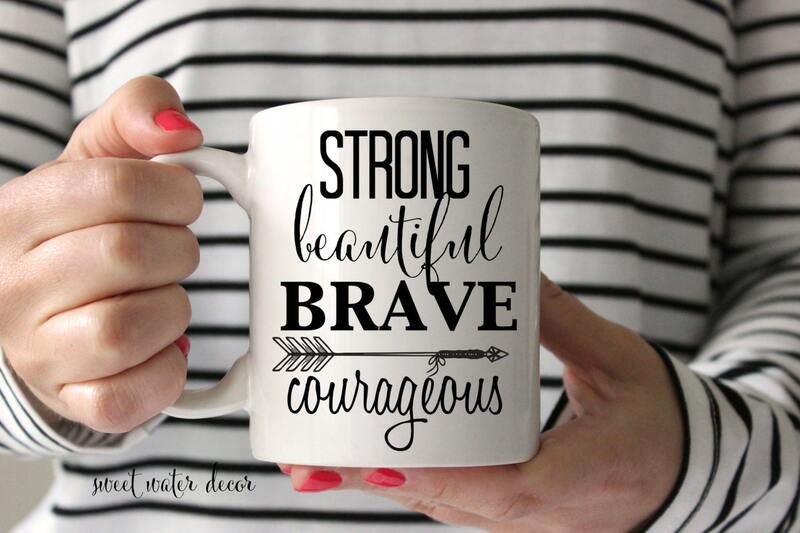 My strong, brave, beautiful, courageous mug and print is one of my absolute favorites. It came to me while washing dishes honestly! I pictured in my mind the woman my mom raised me to be - strong, brave, beautiful & courageous. I added an arrow as well to top it off! Each word has a different font, really bringing out what I hope to inspire other women to be. It was so great to hear from one of my customers, she bought this mug for herself and one for her friend. She wanted to thank me as she was going through fertility treatments and her friend was going through cancer. I hope to touch all of my customers and it really makes me know that God has put me where he wants me - designing & making beautiful works to share with & inspire others. 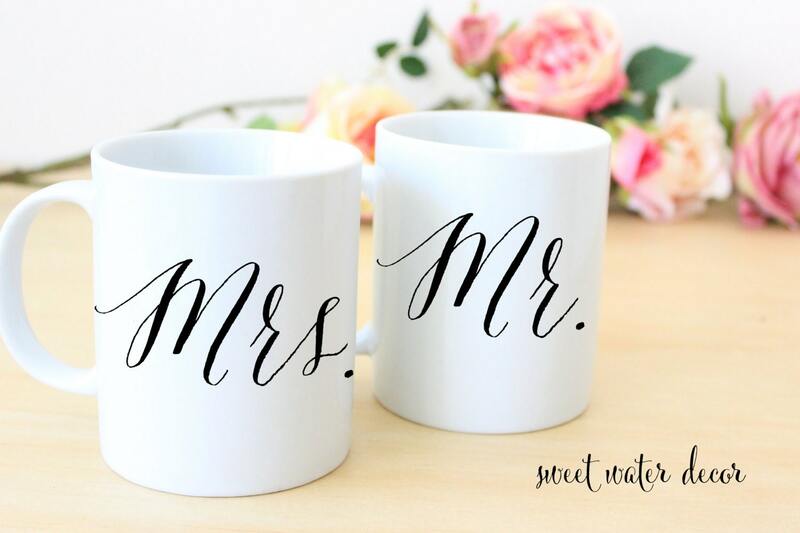 My favorite mug is our Mr. & Mrs. mugs. 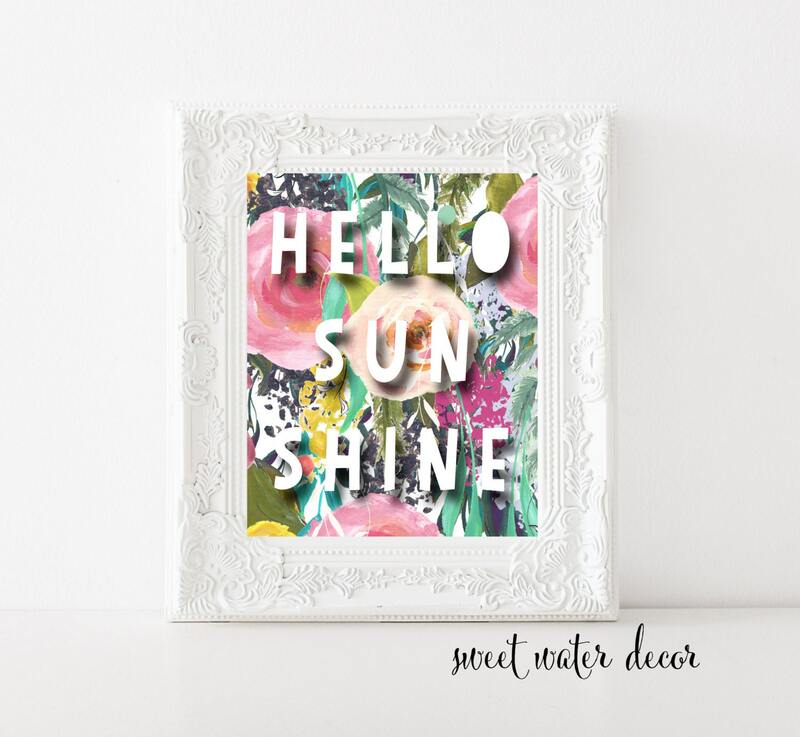 My favorite print is my Hello Sunshine print. You can find Sweet Water Decor on Facebook & Instagram. I used Julep Briana & Kam, Sally Hansen Green with Envy, & Essie Rock at the Top. I also used the Julep Plie Wand & dotting tool to help with the dots! For the clovers, I created 4 sets of 2 dots around an imaginary 'square' shape on my nails, and then put a little more polish in the middle of the dots to join them together. Hopefully the photo below will help illustrate a bit better! Hope you had a lucky day! 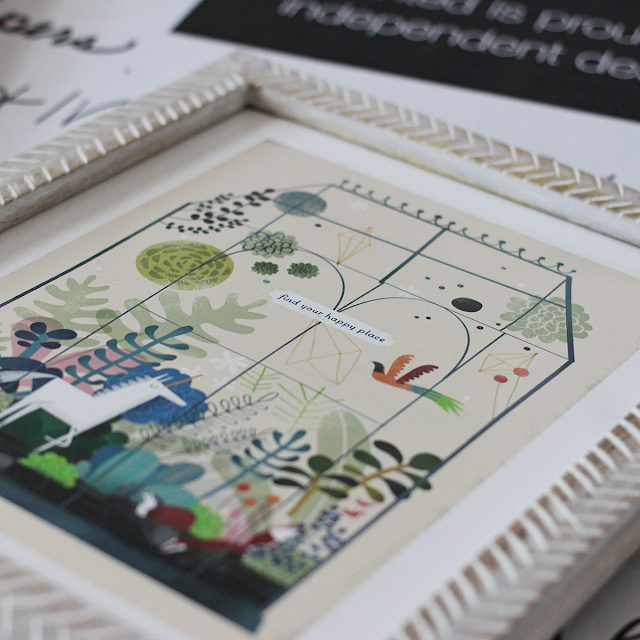 I also love supporting creatives & small businesses, so that's where pretty much all of my art has come from. These shops are full of SO much talent - too much talent to keep hidden - so I'm sharing where all my art has come from over the years. Some pieces are no longer available, but maybe you'll find something you love even more! Most of these stores have really reasonable prices, but if you just don't have much to invest in art yet, I would suggest looking for a bulk discount (like BOGO) or waiting for a sale. Most shops will also offer some sort of first time purchase discount or a code when you sign up for their newsletter. are great places to start your art search. are all on my favourites list.